it seemed such a good plan. With nearly two whole weeks off for Christmas and the New Year, I would run most days, and start to build distance and stamina, with longer runs that it’s hard to fit in when working. However, after an excellent session on the Wednesday before Christmas with the Seaford Striders, I was laid low with man ‘flu. I have missed two parkruns and twitten runs and all those long runs on the downs I’d hoped for. The Brighton 10k: I see I’ve run this every year since 2005, except 2016, when Storm Angus caused the race to be abandoned. This year I was over the magic 60 minutes, finishing in 1:02:19. It was gratifying to take part with a number of my fellow Seaford Striders, some of them from the two Couch to 5k groups I ran in the year. 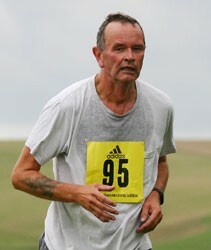 Much to my astonishment, I also scored a new PB at Peacehaven parkrun on 9 December. It was so cold I ran a warm-up lap, which may have been the reason. Tomorrow is the Seaford Striders New Year’s Day run. The weather forecast isn’t encouraging, but I shall use this event to return to running.